Butter three 9 inch round cake pans. Line the bottoms with parchment paper and butter the paper, set aside. Preheat the oven to 350 degrees. Spread the 1/2 cup of skinned pistachios on a baking pan and toast for about 7 minutes until lightly colored. Transfer to a dish to cool. 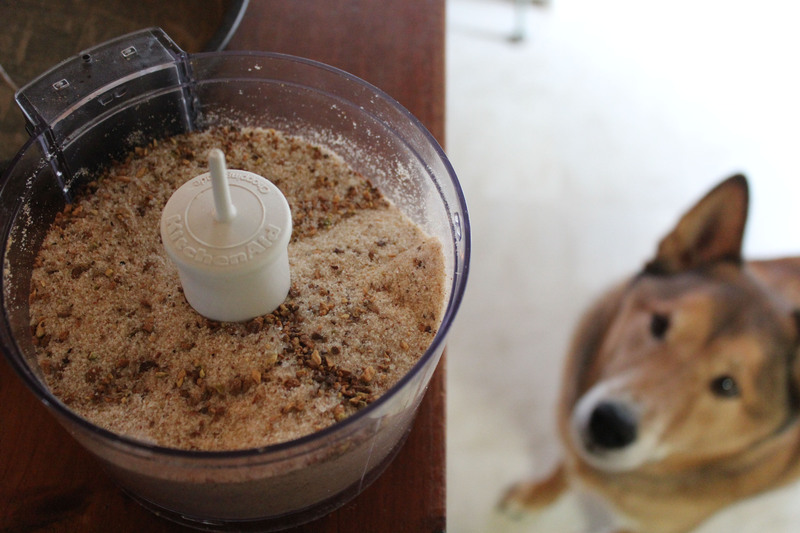 Put cooled pistachios in a food processor, add sugar and pulse until nuts are finely ground and mixed with sugar. Put into a bowl and add flour, baking powder, salt and mix. 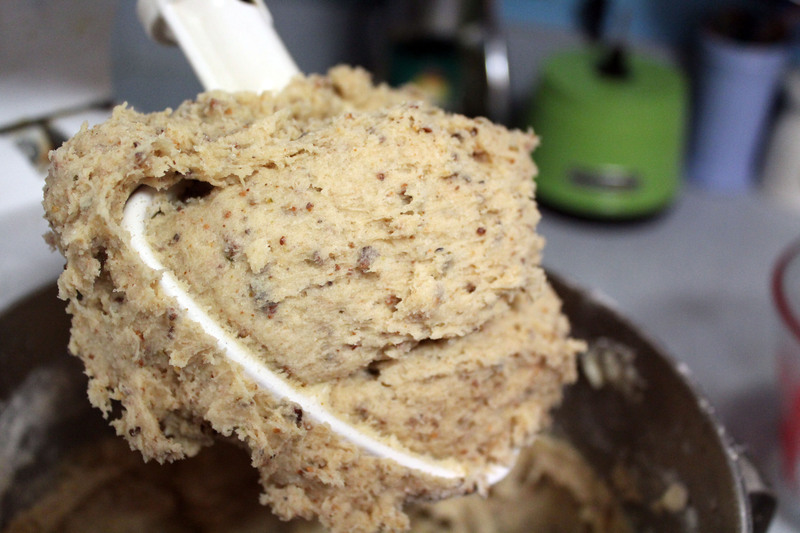 In a mixer add two sticks of butter and beat for 30 seconds to a minute. Alternate adding the flour mix and the milk to butter. Add vanilla and beat until light and fluffy, about 2 minutes. Lightly beat each egg and add one at a time making sure you scrape down the sides and not to over mix, just enough that the eggs are incorporated. Divide batter between the three prepared pans. Bake for 25 minutes on 350 degrees or until toothpick comes out clean. Let the pans cool on a wire rack for about 10 minutes then turn the cakes out, remove the parchment paper and let cool completely. In a small saucepan heat the apricot preserves on low stirring occasionally until smooth. Set aside and let cool a bit. 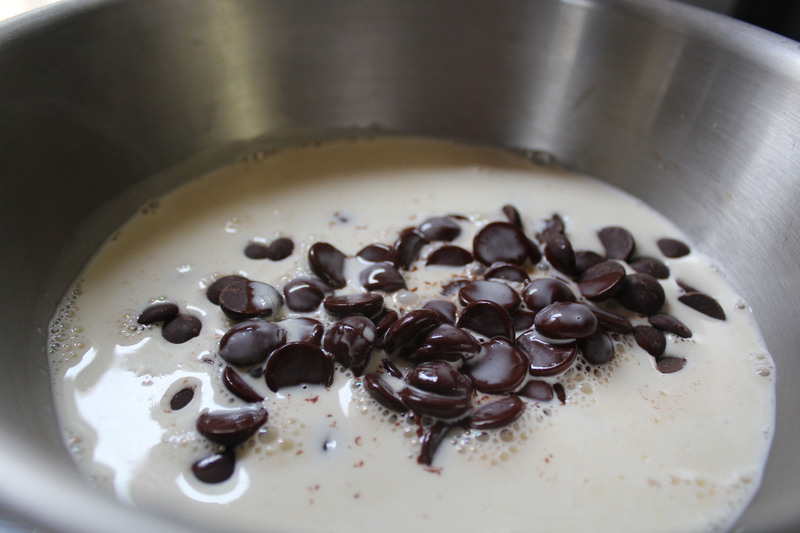 Place bittersweet chocolate chips in a heat proof bowl. In a saucepan bring the heavy cream to a simmer. Pour hot cream over chocolate and let stand for 5 minutes. Whisk until smooth and use the glaze soon after making so that it does not set on you. ( I found that the heated cream alone didn’t fully melt the chocolate so I had to set it over a pot of simmering water to make a double boiler to melt it all the way. It only took a few minutes and make sure you stir it the whole time! To assemble cake: Place bottom cake layer on a wire rack over a baking pan. I placed parchment paper strips under mine to transfer the finished cake to my serving plate. Spread about 1/4 cup of apricot preserves on top and smooth out leaving about 1/4 inch margin all around. Then spread about 2 spoonfuls of the ganache on top. 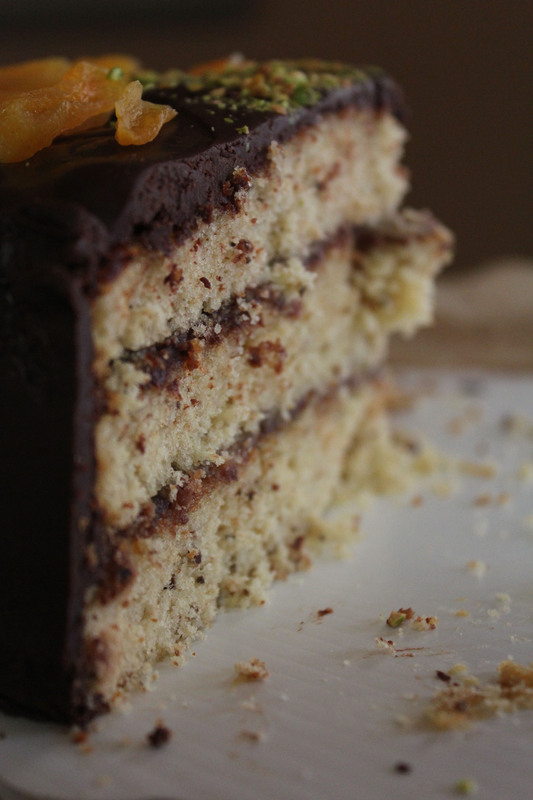 Place second cake layer on top and repeat the apricot and ganache steps. Place top cake layer and add apricot layer. Let sit for a few minutes to set a bit then slowly pour ganache on top of cake and evenly spread around so it covers entire cake. Use an off set spatula to help cover the sides (aren’t you glad you have a cake pan underneath!) This may take a few additions and much spreading around to cover the whole thing so don’t feel you have to get all the ganache out of the bowl on the first pour. Allow the cake to set. 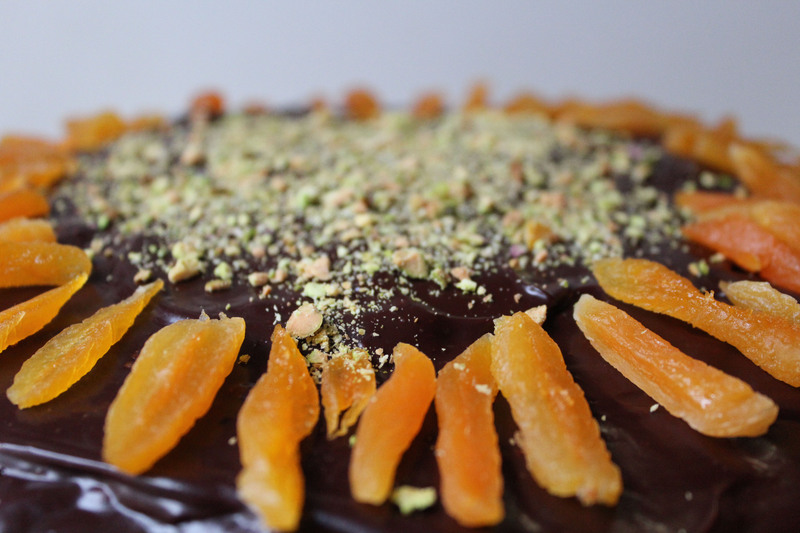 While cake is setting you can finely chop the remaining 10 or so pistachios for garnish and with kitchen scissors cut strips of dried apricot. 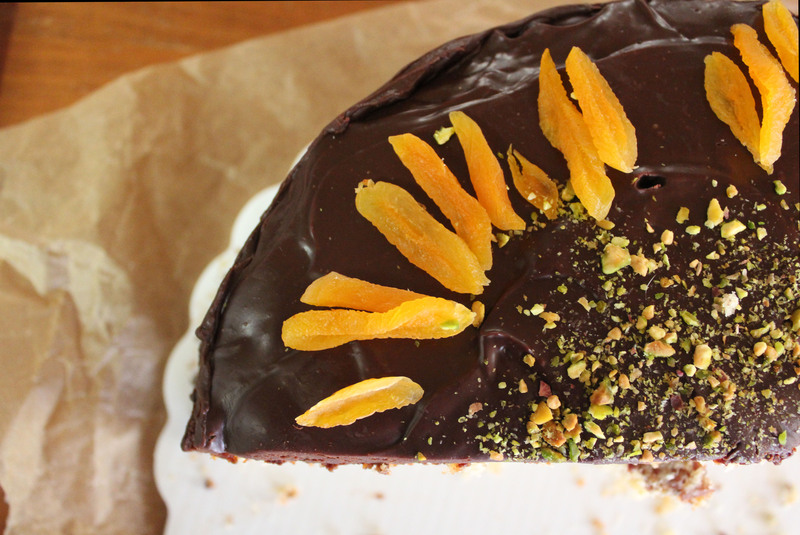 When ganache is set garnish with toppings. Enjoy! Yum, doesn’t that just look like pistachio ice cream? No? Oh, well have a great day everyone! P.S. 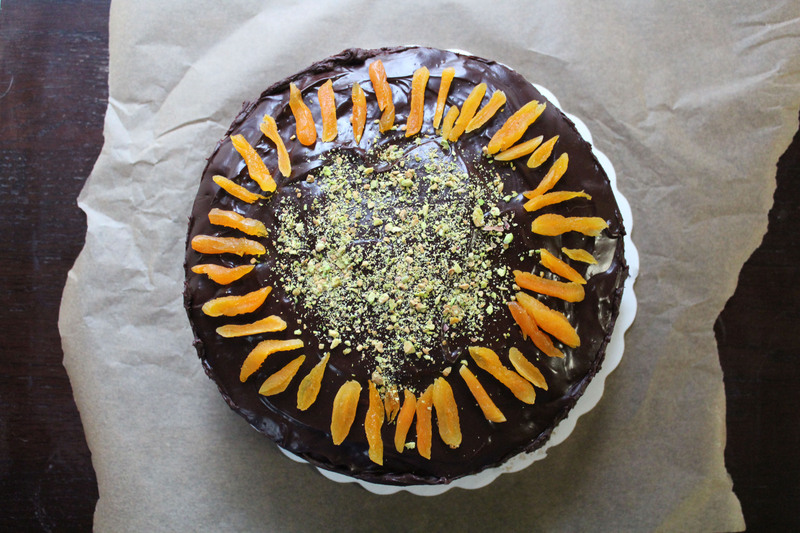 if you have extra ganache like I did why not dip some dried apricots in it, so good! oh wow.. this looks good enough to consider licking my pc screen! Definitely a recipe I would look at trying out in the near future! Thank you! It was very good, you should make it! And here I am without an oven. But as soon as it’s replaced/repaired, I am definitely making this! Oh no, no oven! That’s the pits! But when you can you should try this, it is very good.